WASHINGTON (CNN) - Members of the Republican National Committee elected their first-ever African-American party chief on Friday, choosing former Maryland Lt. Gov. Michael Steele to chair the organization after six tumultuous rounds of voting. The often contentious race for the chairmanship came down to a choice on the final ballot between Steele and Katon Dawson, the South Carolina GOP chairman who secured strong support from party insiders after former RNC leader Mike Duncan dropped out of the race earlier in the day. Steele emerged as the winner on the sixth ballot, earning 91 votes to Dawson's 77. "We're going to say to friend and foe alike, we want you to be a part of us," Steele told party members in his victory speech. "And to those of you who will obstruct, get ready to get knocked over." For the duration of his campaign, Steele fought suspicions that he was too moderate to lead the party because of his blue state roots and his former membership in the Republican Leadership Council, a group that sought to curb the influence of social conservatives in the party. "I'm proud to say I'm a conservative, have been, always will be," Steele told CNN earlier this month. "So this notion that I'm a moderate is slightly overblown, and quite frankly a lie." Steele was similarly hampered by the perception that he was too much of an outsider to run the 168-member party, but he was able to demonstrate momentum in the final days of the campaign by rolling out a cluster of endorsements. He also boasted the help of some of the country's top political consultants: At a closed-door question-and-answer session with members late Thursday, Steele told the crowd he had spent over $200,000 on the race, more than any other contender. The new chairman brings a national profile to the committee, having shot to fame in the political world during an underdog Senate bid in 2006 distinguished by a series of clever TV commercials. He has since become a fixture on cable talk shows, experience that boosted his reputation as the most able communicator in the field of candidates. During the Republican National Convention in St. Paul last summer, Steele made a splash by coining the phrase "Drill, baby, drill!," which quickly morphed into a rallying cry for the GOP base at campaign rallies around the country. After Friday's final vote, Steele assembled a press conference and told reporters that the GOP needs to fix their "image problem" by focusing on "issues that touch the fabric of people's lives." "We have been mis-defined as a party that doesn't care, a party that's insensitive, a party that is unconcerned about minorities, a party that is unconcerned about the lives and the expectations and dreams of average Americans," Steele said. "Nothing could be further from the truth." Steele promised that the party will be run as a bottom-up organization and that the RNC will be "moved into the grassroots." But he offered few specifics on his plans to re-structure the party, saying only that he hopes to get fresh ideas from state parties. "My expectation is that they're going to come to me with a plan, a strategy," he said of the states. Steele's victory capped off a tumultuous day that saw six arduous rounds of voting and an acknowledgment of defeat from Duncan, who stepped aside after the third ballot, having bled support throughout the voting process. "Obviously the winds of change are blowing here at the RNC," Duncan told party members, who gave him a standing ovation. On the fourth ballot of the day, with many members no longer having to consider their loyalty to Duncan, Dawson rocketed into the lead with 62 votes, putting him ahead of Steele's 60. But Dawson's short burst of momentum was blunted minutes later when former Ohio Secretary of State Ken Blackwell quit the race and surprised the audience by throwing his support behind Duncan. On the subsequent ballot, Steele picked up 19 votes while Dawson gained just seven. Michigan GOP chairman Saul Anuzis, whose support topped out at 31 votes, dropped out after the fifth round of voting but did not endorse a candidate. Most of his supporters then backed Steele in the final vote. 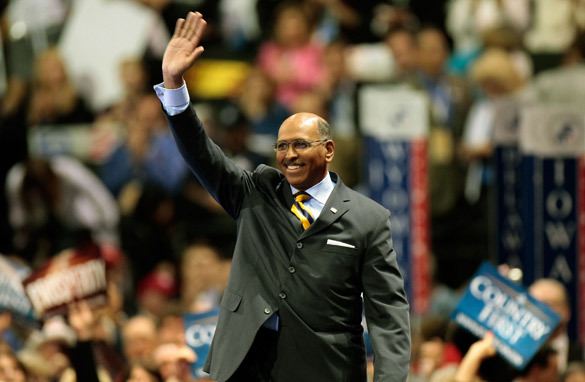 The RNC election of Michael Steele is a great pick. Like Louisiana Governor Bobby Jindal, Mr. Steele is smart, pragmatic, corporate friendly, and a real solution finder. However, with Steele's pick as RNC Chair, the battle lines have been solidified between PRAGMATIC PROGRESSIVE REPUBLICANS (e.i. John McCain, Chuck Hagel, Colin Powell, Tim Pawlenty, Arlen Specter), and the FIERCELY RADICAL RELIGIOUS RIGHT (e.i. Sarah Palin, Chip Saltsman, Saxby Chambliss, and Rush Limbaugh). when Steele to the stage have any significance? WHOA..., lit up the torches. the ignorant cuckoos are going to a barnyard meeting tonight to discuss their options to impeach. I love all the blatant condescension from so called "progressives" who supposedly "own" the black experience. Last I checked democrats have been taking the black vote for granted while blacks are no better off today then 30 years ago. Sure, Obama was elected but that was the biggest case of affirmative action we have ever seen. Steele have to go in the deep south than he see if he black anougth, then when they pick Palin I bet Steele would not show up to those rallys, or maybe the RNC wants to see Black on black crime in polictics. What political office does Steele "Currently" hold? Not Amused and Marcelo ... What are you'll?? Some type of echo?!? Well, imitation is the most sincere form of flattery. Yipee for the RNC and the DNC. What's amusing is the obvious response of the White Supremacists ... Only in America! !